Always wanted to learn to knit, but not interested in making an ugly scarf? 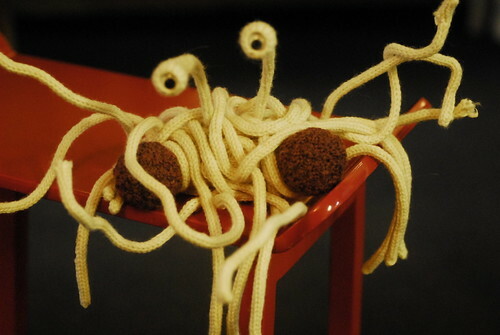 Just want to make a cuddly Flying Spaghetti Monster? Either way this workshop is for you! Come on Tuesday, June 25 from 7 PM to 10 PM. Toys are fun projects for novice knitters because they are small, and introduce techniques needed for more complex projects. Workshop fee ($60) includes knitting pattern and all materials. To register, give us a call at 206 357 9406 or come down to our shop. Space is limited.